I’m a 19 year old male student with Cushing’s syndrome. Basically had accelerated weight gain since late 2011, despite frequent exercise and heavy dieting. It was entirely reasonable for her to think this, but when the stretch marks didn’t fade as they normally would i did a google search and returned. Urine test, blood ACTH and cortisol test, repeat urine test. Soon I was sent to an endocrinologist who confirmed Cushing’s syndrome. 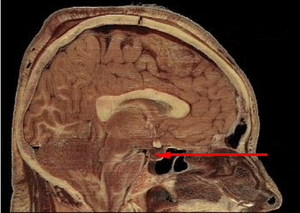 I just had an MRI of my pituitary after the ACTH signs pointed to a pituitary source. The Endocrinologist said it appeared to have a 3mm lesion, but it was not 100% conclusive so I am to undergo petrosal sinus sampling for confirmation within the month. Hopefully that will confirm the adenoma with surgery ideally soon after that. I’m happy to have got it reasonably early; most of my symptoms are still relatively mild, but it really does make you put other things on hold until you can fix it, which means i’m sort of stuck in a lull until its all fixed. I would appreciate any advice for things to do in the mean time to help me feel like i’m doing something positive rather than just waiting. Jarryd, It is great you are getting this taken care of early! As I am sure you have read that the vast majority of folks with a pituitary tumor get completely better after the first surgery, for it never to return. This is my hope and prayer for you! You don’t see a lot of stories like that on the Cushing’s web site, I think because those folks got to go back to their regular lives! I just wanted to remind you of that so we “old Cushie’s” don’t get you down. Good Luck! and let us know how great you are doing afterwards, so we can share your joy! I am so sorry it seems there are so many in the medical field, that fail to recognize the symptoms! Horrible symptoms and other than the weight gain, no one sees what you are really feeling. Prayers for your quick recovery and better health! hey, i also had my transphenoidal last july 13, 2012…. but as of now, it seems that i am not get any smaller/ thinner.. im still always feeling sleepy at around 7 or 8 in the morning. ive done acth, urine cortisol test. . . im planning to have an mri again of the pituitary gland next month. . .. any way, im hoping for your fast recovery. I simply couldn’t leave your site prior to suggesting that I actually enjoyed the standard info a person provide to your guests? Took more tests, 24 hour and saliva. Both high on cortisol. MRI showed 4mm microadenoma. So now I am same boat as you waiting on results of recent IPSS procedure they did last Friday to make sure the spot on my pituitary is the cause. Basically stay strong and you can do it!! After months of people telling me it’s all in my head (even my own husband poor guy) I finally know that it wasn’t just stress. I find out there are a lot of other people suffering like us and makes me feel good to know there are things like these bios to get us through. The worst about cushings is the emotional mental hit you take. Just remember that you are not alone and God knows exactly how we feel. He is there by our side getting to the right doctors and through this. You totally got this. Give it time and eventually this will all be s bad memory. Luckily yours is a microadenoma so they should be able to remove it and low chance of it coming back.